Not being there and all........sounds like you've been pretty thorough. If one were testing for LSD - the LSD would have to be laid out on some type of filter paper - or blotter paper in order to see the reaction. I dunno. If you can perform an extraction, it would be another cool test to perform - just to see if you get a different result. I'm curious. How much reagent did you purchase and for what amount? Does it have an expiry or shelf-life? I've been looking into getting a 'scope... just waiting for my millions of dollars to come in haha! Found some decent ones. The extraction idea sounds pretty neat, actually. Wondering if I should give that a go.... hmmmmmmm... Would it give different results, tho? It would still be the same chemicals... research time! I saw this, and I gasped!!! Keeping fingers crossed!!! This jar is from the batch I made with the whole wheat pasta/white rice/quick oats flour... It's been a while, but I'm finally seeing something!!! No pics, but it turned brown/black.... unless that's supposed to happen...? If there are any indoles in the test materials they will be extracted into the alcohol. That is an awesome tek! Thanks for this! Tomorrow is grocery day, so I'll see if I can slip over to the liquor store! PS: What do people think of the recent pics? There is a Hamilton episode where some folks living in the hills collect Amanita Muscaria for magical/healing use. Amongst the many ways we see them being used was soaking what looked like fresh material in what looked like Vodka then drinking the Vodka for psychoactive effect. Unfortunately the Wikipedia articles on Ibotenic Acid and Muscimol don't seem to mention solubility in alcohol though. Perhaps a kitchen chemist can chime in? 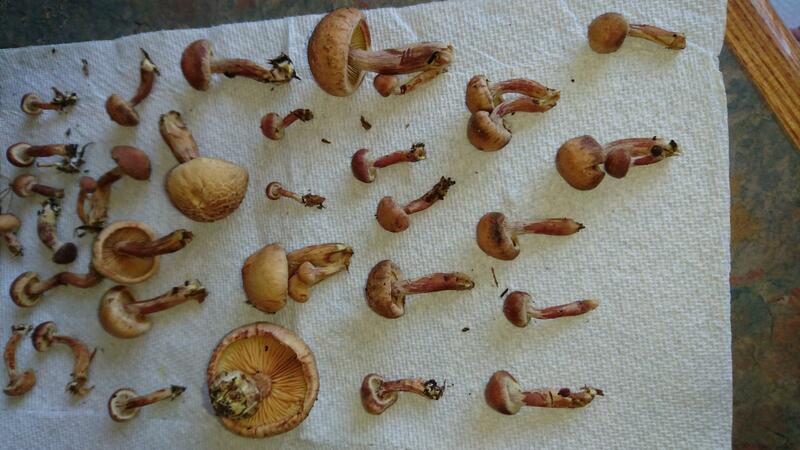 These look like gymnopilus luteofolius to me. They have a bright rusty spore print. Thanks for the post, cubes! I bought an Ehrlich reagent (in my research, I found some people recommend it) and upon testing dried and recently picked samples, I got a yellow-green coloration. However, the info card that came with the reagent says (while it is primarily used for testing LSD, it does say it can react to other indoles such as psilocybin and psilocin) that the color should be purple. That might just be for LSD and related chemicals...? On one site I visited, someone mentioned that the Ehrlich reagent does NOT test positive for Gymnopilus or Pluteus species... Well, the yellow-green is not a positive test result, according to the info card. Edited by OldAndMiserable, 29 October 2018 - 10:28 AM.